Since starting back to diligently counting points I've found some new to me things that I'm loving. I thought you might love them too! You can have 3 full cups (1 oz) of this fake-cheesy, salty, goodness for only 4 Points Plus. Um.... what are you waiting for? Why are you still reading this post... go to the store and get some... now! Just remember that if Cheetos/chips are a red light food for you, definitely pre-portion these first so you don't find yourself eating the whole bag, and don't say I didn't warn you! 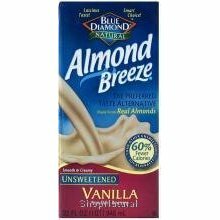 OK, you guys probably already know about this, and I'm late to the party, but the Almond Breeze unsweetened vanilla almond milk is 1 Points Plus for 1 cup! I love it in smoothies, on my oatmeal or over my cereal. 0 points of deliciousness! And if you think grapefruits are sour nastiness... try this kind. So sweet! For some reason, eating a grapefruit squashes my cravings for other things... not sure why, but I'll take it. 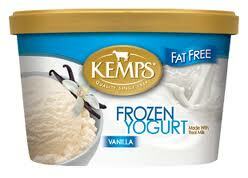 So I've discovered Kemp's fat free frozen yogurt - vanilla flavor. It's only 2 Points Plus. I add half an ounce of salted cashews for another 2 Points Plus. Salty and sweet, yes please! This lunch (half salad, cup of soup) - minus the baguette - for 8 Points Plus! 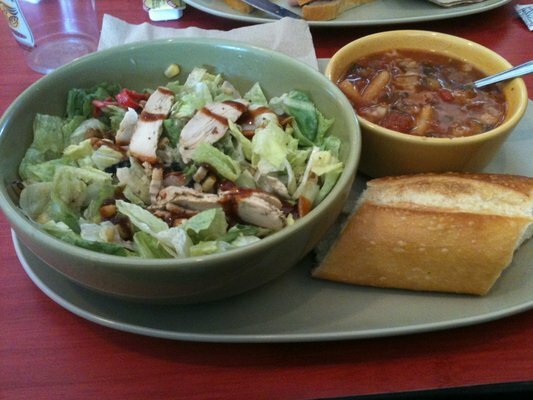 So delicious, and an amazing choice for eating out and staying 100% on plan. These are almost like little round pitas. You find them by the prepackaged breads... not in the "bakery section" You can carefully slice them in half and make into 2 pieces. I've been toasted and eating with butter for breakfast. 4 Points Plus total! I've finally stopped buying those oatmeal packages. This is cheaper, you get a bigger serving, tastes better, and has less sugar. I take 1/2 cup of old fashioned oats, 1 Tbsp craisins , 1-1/2 Tbsp ground flax, 1 Tbsp brown sugar and make it in the microwave in a big mug. I add 1/2 a cup of almond milk. I hope this gives you some new food ideas. What are you loving right now? Leave me a comment, as I love to get new ideas, or post a comment to my facebook page. 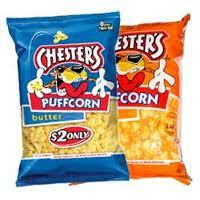 I shall definitely be getting some of that Chester's. Also, Almond Breeze Vanilla is the best! It's the only thing I have in my house since I don't drink milk fast enough. oh, my lord. now that biggie knows there's a younger available chick with a cabinet stocked with Cheetos puffcorn, that boy is going to be knocking down lily's door. heidi sent us over and i'm so delighted she did! wishing you all the best as you champion for yourself and your littles...especially sweet lily! I ditched the instant oatmeal, too. I cook it on the stove... DH says it's too "mushy," but oh well. He still eats his bagels, lol.